Moving abroad can challenge the meaning of home, open new horizons, and change us as people. At the very least, it inevitably results in a collection of fascinating stories. These stories of people on the move find a home at the Expatriate Archive Centre (EAC), a private, nonprofit archive in The Hague that collects diaries, letters, photographs, blogs and other material documenting life abroad. The idea of the EAC came about in the early nineties, when a group of women who had spent the majority of their adult lives moving from country to country decided that the stories of people like them should be given a voice. They sent out a call for stories from around the world and published them in a book, Life on the Move, which was followed soon by a sequel, and then by a flood of more stories than could fill a whole series of books. Eager to preserve these life stories and make the social history they represented available for academic research, they decided to start an archive. The EAC today contains around 120 collections, dating from the late 19th century to the present and representing over 80 countries and dozens of different languages and nationalities. The EAC was officially organised as an independent foundation in 2008, and this year celebrated its 10th anniversary with an exhibition of contemporary art inspired by the stories within its collection. 10 artists from around the world each chose a piece from the EAC’s collection that spoke to them in various ways. One artist, for example, was drawn to the collection of a family that was separated by WWII. The father went ahead to work as a civil servant for the Dutch government in Indonesia in 1940, and his family intended to follow later. The outbreak of the war prevented the family from moving to Indonesia, and landed the husband in a prisoner-of-war camp. Their collection is a combination of the husband’s memoirs of this period and the wife’s unsent letters to him in diary form. Many of the artists found that the material in the archive corresponded with their own experiences in very different times and places. They worked in different media, including gold and rubber, photography, stampmaking, ceramics, printing and painting. All of the 10 art pieces were designed to fit together inside an antique suitcase which was originally donated to the EAC by one of the founders and has become a sort of mascot for the EAC. 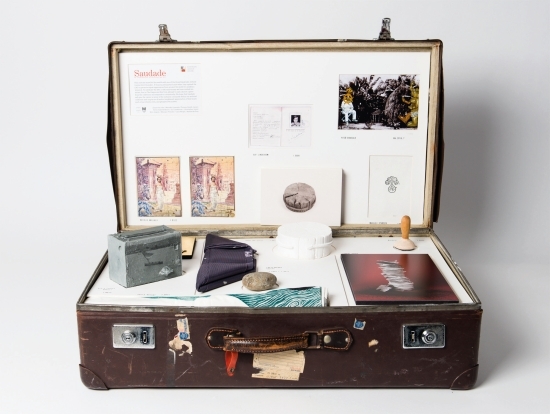 The suitcase serves as a visual reminder of the things people chose to take with them when they move, and, by extension, also the many objects, people and places left behind. The name of the project, Saudade, is a Portuguese word that can be translated as profound longing for someone or something that is both absent and beloved. The Saudade exhibition was open from April 11-15, 2018 at Twelve Twelve Gallery in The Hague. It is designed as a traveling exhibition, so it will be on display during the rest of the year at other locations throughout the Netherlands. If your gallery, museum, archive, bookstore, school or organisation is interested in hosting Saudade, contact Kristine Racina at [email protected] xpatarchive.com. As a companion to the Saudade project, the EAC has also published a Saudade book documenting the project. It includes images of the art and the archival pieces that inspired it, as well as conversations with the artists, essays from an art critic and an historian, and the parallel stories of the EAC itself and the famous suitcase.